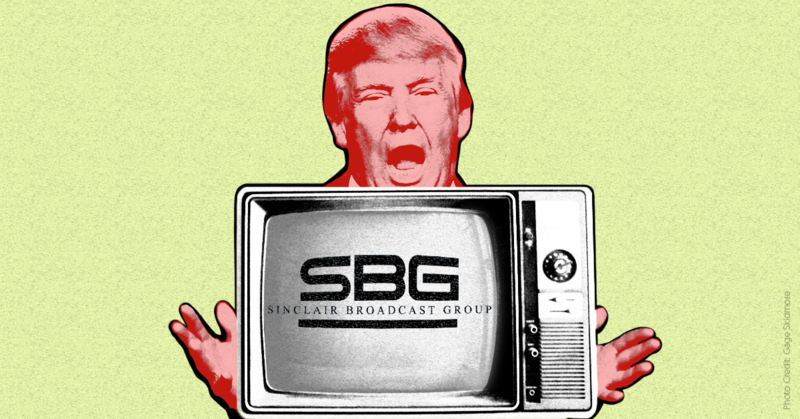 Under the watch of multiple Trump administration agencies, conservative local TV news giant Sinclair Broadcast Group is preparing to finalize its massive acquisition of Tribune Media, which will allow the company to spread pro-Trump propaganda and fearmongering rhetoric even more widely across the country. If the merger is approved, it will be the culmination of a series of handouts from the administration to Sinclair, beginning shortly after Sinclair’s top executive told then-candidate Donald Trump the outlet was there to “deliver [his] message” to America. Here’s a closer look at the extensive relationship between Sinclair and the Trump camp. During the 2016 campaign, Sinclair chairman (and then-CEO) David Smith said he told Trump during a meeting, “We are here to deliver your message. Period.” Trump adviser and son-in-law Jared Kushner also bragged about making a deal with Sinclair, agreeing to give Sinclair more access to Trump as long as interviews were aired without commentary. The day before Trump’s inauguration in January 2017, Smith, along with Sinclair President Christopher Ripley and Sinclair business partner Armstrong Williams, again met with Pai to discuss relaxing media rules. Pai was named chair of the commission by Trump several days later. In February 2017, Pai relaxed a rule related to the FCC’s oversight of local TV sharing arrangements for facilities, employees, and services. This was the same rule he’d discussed with Sinclair executives weeks earlier, and Sinclair has a well-documented history of relying on these arrangements to skirt ownership caps. In April 2017, the FCC reinstated an outdated media ownership rule known as the UHF discount, making room for a new level of local media consolidation at the hands of big media groups like Sinclair. Reinstating this rule means that Sinclair can count the stations it owns and operates in a misleading way so that it technically stays under the designated cap for the number of stations it can own nationwide, even though it far exceeds that cap in practice. Weeks later, Sinclair announced it was proposing to acquire Tribune Media, a huge local-news merger that wouldn’t have been allowed without the UHF discount in place. The FCC and Trump’s Department of Justice are now the only agencies that need to approve the deal. In October 2017, the FCC voted to eliminate a rule that required local news stations to maintain offices within the communities they serve, making it easier for Sinclair to consolidate and centralize local news resources as it buys up more stations. In November 2017, the FCC rolled back rules that limit broadcast station and other media ownership in any given local media market, allowing for Sinclair to more easily own or operate multiple stations -- or merge stations -- in the same local area. In April 2017, Sinclair announced that it had hired Boris Epshteyn to serve as its “chief political analyst,” producing frequent “must-run” commentary segments about political issues that Sinclair requires its local news stations to air. It upped the segments’ frequency months later. Epshteyn had previously worked in the Trump White House on the communications team, after doing stints on the Trump inaugural committee and on the Trump campaign. Epshteyn also served as a Trump media surrogate throughout the campaign and first days of the Trump presidency. Epshteyn is personal friends with the president’s sons Eric and Donald Jr., and he has been spotted at Trump International Hotel multiple times, including with Don Jr. in June. Epshteyn has returned to the White House several times since his departure, seemingly to attend events as a member of the press. 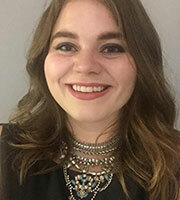 In May 2018, Sinclair hired another Trump campaign and White House alum, Kaelan Dorr, as Epshteyn’s executive political producer. In a June 14 Instagram post, Epshteyn wrote that he and Dorr shared a McDonald’s meal to celebrate Trump’s birthday. Media are biased against the Trump administration. The FBI is also extremely biased against Trump. The Trump administration’s family separation and child detention policies were overblown by media. Trump’s taunts to North Korean dictator Kim Jong Un about a “nuclear button” constitute good foreign policy. Trump’s racist comment about “shithole countries” is mere “salty language” that the media are unnecessarily repeating. GOP losses in state elections do not reflect poorly on Trump. More Americans should be like actor Bryan Cranston, who remarked during an interview that people ought to hope Trump succeeds for the good of the country. Conservative pundit Armstrong Williams hosts a weekly show that airs on the Sinclair-owned News Channel 8 in the D.C. area and is syndicated on other Sinclair local TV stations across the country. Williams also owns several local TV stations through his holding company, Howard Stirk Holdings, which in turn sends business back to Sinclair through operations agreements. Recently, Politico reported that Sinclair offered to sell three stations to Williams for “just a fraction of the market price.” The stations must be sold in order for Sinclair to nominally comply with current FCC ownership rules. Sinclair will use various legal agreements to skirt the rules and continue operating the stations. Williams is a close confidant of Secretary of Housing and Urban Development (HUD) Ben Carson, even doing public relations work on Carson’s behalf while continuing to also work as a media figure. He also served as a Carson presidential campaign adviser while maintaining his weekly hosting duties. Since 2016, Carson has appeared at least twice on Williams’ TV show -- including for his first televised interview since becoming HUD secretary -- and at least twice on his radio show, which is not affiliated with Sinclair. About two months after Williams joined Sinclair executives in a meeting with FCC chair Pai in the spring of 2017, Pai made a friendly appearance on Williams’ show. Trump granted three of these exclusive interviews to Sharyl Attkisson for her weekly national Sinclair show Full Measure. Attkisson is a right-wing conspiracy theorist hired by Sinclair in 2015, and Trump was her first guest when the show premiered. Subsequent interviews aired in April, right before the Wisconsin primaries, and in September. In November 2017, Trump again sat down for an interview with Attkisson. In it he made several demonstrably false claims without any challenge and again attacked “fake” media. Several media figures affiliated with the Trump campaign, Trump administration, or Republican Party have promoted Epshteyn’s must-run content. This includes Trump campaign spokesperson Katrina Pierson, former Trump communications aide Jason Miller (several times), GOP Chairwoman Ronna Romney McDaniel, GOP spokesperson Kayleigh McEnany, former Speaker of the House (and Trump ally) Newt Gingrich, and former President George W. Bush press secretary Ari Fleischer.